If the law was different our son Joe would still be alive. Joe was our only son. Last August he was arrested after failing a breath test. He was just seventeen and made a bad decision to drive home after a party. Two days later Joe took his own life. We found him at home with the police charge sheet at his feet. That was the first we knew about the arrest. Because Joe was seventeen he was treated as an adult at the police station so the police didn't call us. The trauma of the situation led Joe to take his life. 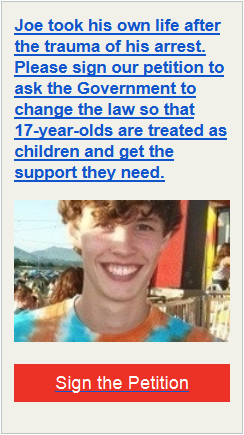 We don't think any teenager should have to go through that alone, so we've started a petition on Change.org calling on the Government to change the law to ensure seventeen-year-olds are treated as children upon arrest. If arrested, seventeen-year-olds are treated as adults while in custody -- but if they go to court they are rightly treated as children. This is an anomaly of British law and needs to be fixed. If we had been told about Joe's arrest we could have supported him and let him know that you can get through things like this. Unfortunately Joe is not the only seventeen-year-old to have taken his own life after being arrested. For someone of any age being held in a police station is a traumatic experience but especially so for young people without the support of an adult. Right now a judge is considering whether to recommend the Government changes the law but the Government is contesting the case, arguing it's expensive to change. We believe if enough people sign our petition we can convince MPs that protecting our children and fixing this anomaly is worth it. Please help by signing our petition calling on the Government to change the law.